Raise your hand if you heard about the new tax law? Now, raise your hand if you understood some of them. For the rest of you, raise your hand, if you have no clue what I’m talking about. President Trump signed the new tax reform bill into law last year. This is the most significant tax change in more than 30 years. So the million dollar question is: How will this affect you? 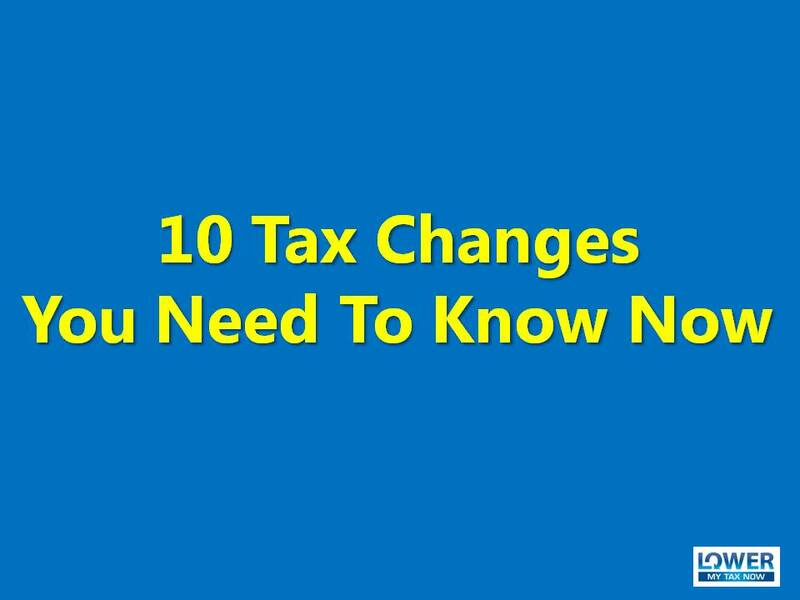 So today, I’m going to share with you 10 tax changes that you need to know now so you can plan and prepare for 2018. Are you ready? Across the board, all the tax brackets went down by 3% give or take. What does that mean to you? If everything is equal, meaning, your tax situation is the same, then you will get slight tax refund on your return next year. #2. Standard deduction doubled & elimination of exemptions. For single filers, the standard deduction increased to $12,000; for married couples filing jointly, it is increased to $24,000. What does that mean to you? It could be a good thing or a bad thing? It’s a good thing if you were filing standard deduction from previous years because you will benefit by the increased deductions. However, it’s a bad thing if your Form Schedule A itemized deductions is lower than the new standard deduction. Basically you are losing out on some of your deductions which we are going to talk about later. #3. Medical expenses are still deductible. They almost took this out. Let’s talk about this. You can only deduct medical expense in excess of 7.5% of your income. So for example, you make a $100,000, 7.5% of $100K is $7,500. That means, if your medical expenses were $8,000, then you can only claim $500 of medical expenses. My client, who had a kidney operation learned about the limitation, so he asked me: Noel, how can I deduct my kidney operation? I told him: have another surgery? So that’s what you have to do. You need to see if you can bunch major medical expenses into one year to get the medical deductions. #4. State and property tax $10K limit. Here’s the good news: you can still deduct your state tax withholding, sales tax and property tax on your return. Here’s the bad news: you will be limited to $10,000 of deductions. What is your strategy? Well, the state is coming up with a bill. They will create a fund that you can donate money for the benefit of various California agencies. You will get a potential tax credit for CA and an IRS tax deduction. Example: If you give $100K to this fund, you will get back $100K CA tax credit and also 37K of IRS tax savings (assuming you are in the 37% IRS tax bracket). In essence, you got back $137K by contributing $100K to this fund. It’s in the works. Beware though! IRS might not approve and will contest this. #5. Mortgage loan $750K limit. Mortgage interest will be limited to mortgage debt of up to $750,000 ($375,000 for married filing separate). Home equity line of credit cannot be deducted anymore (you need to review your equity line interest rate and compare with your investments to determine if you need to pay it off. Also, try to pay down your mortgage debt if it’s more than $750k and you can also downsize to meet the $750K mortgage debt limit). No deduction is allowed for miscellaneous itemized deductions (these include unreimbursed employee expenses, management fees, tax preparation fees, investment expenses, etc. )(You need to discuss this with your employer and see if you can ask for an expense reimbursement or a salary increase to cover the expenses. Raise your hand if you know someone that got divorced last year? Now raise your hand, if you know someone will get divorce this year? You know the big difference? Your ex will get more than half. Alimony payments will no longer be deductible for the spouse who writes the checks. Likewise, it’s not taxable to the one receiving the payments. That means you have to take this into account – non-deductible alimony payments – in case you get divorce and trying to finalize a settlement in the future). Keep in mind though that this tax change will be effective for tax year 2019. Since the standard deduction went up, you might not be able to go over the standard deduction. You might feel that you are losing out on the charitable deductions. What do you do? You would give the same amount over a two-year period, but you would bunch them into one year. This will help you itemize your deductions so you don’t lose your tax benefits. #9 Lower corporate tax rate. Raise your hand if you have a C-corporation. The corporate tax (C-corporations) will go down from 35% to 21%. They now have a flat tax rate of 21%. What is the only issue? If your net income is usually less $50K, under the old law, you will only pay 15%, under the new law, you will pay 21%. That means you are paying more taxes. What is the solution? You need to look at the other business structure and see if you will come out ahead. Pass-through entities like S-corporations, LLC, and partnerships – who report their business income on the owner’s personal tax returns, and a sole proprietor, will have a 20% deduction. The 20% deduction would not be allowed if you are in a service business unless your taxable income is less than $315K for married and $157.5K if you are single. 30 Corporate Park, Suite 102.